DA Form 4856, Developmental Counseling Form is a form issued by the Department of the Army (DA) and used by the unit leaders to help organize and structure the counseling sessions. The newest edition of the DA 4856 - sometimes incorrectly referred to as the DD Form 4856 - was issued on July 2014 and remains in use. An up-to-date fillable version of the form is available for download below. 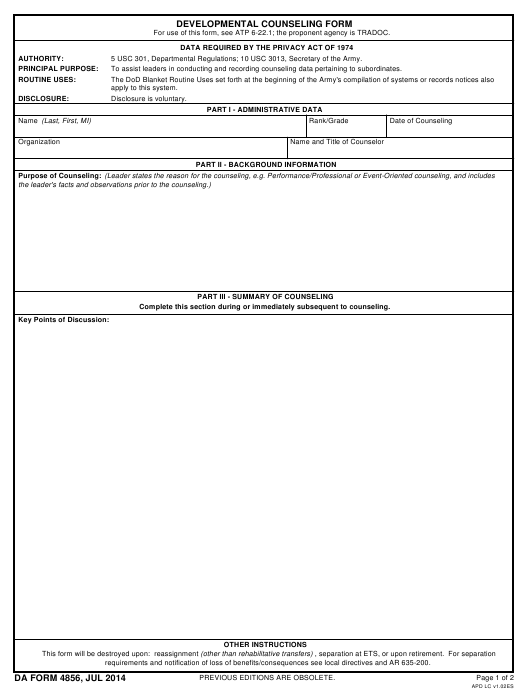 Several versions of the DA Form 4856 Continuation Page are available online, but none are officially released by the Department of the Army. What Is DA Form 4856? The DA 4856 is an official paper intended to document counseling sessions provided by unit leaders to the soldiers of the U.S. Army. The form is used only during military counseling. All of the information within the form is kept strictly private but may be voluntarily disclosed later on by the person being counseled. To serve as the follow-up after regular counseling sessions. How To Fill Out Da Form 4856? For use of this form, see ATP 6-22.1; the proponent agency is TRADOC. 5 USC 301, Departmental Regulations; 10 USC 3013, Secretary of the Army. To assist leaders in conducting and recording counseling data pertaining to subordinates. Complete this section during or immediately subsequent to counseling. requirements and notification of loss of benefits/consequences see local directives and AR 635-200.
disagree with the information above. Note: Both the counselor and the individual counseled should retain a record of the counseling. The DA Form 4856 is convenient and mostly self-explanatory. Fully completed DA Form 4856 examples are also easily found online. The form consists of four parts. The first one contains the personal information of the individual receiving the counseling: their full name, rank, and organization as well as basic information about the counselor. Part II is for the counselor to fill out prior to the session. The review should be brief and provide the main purpose of the upcoming counseling session and any facts and observations important to the case. Part III contains a summary of the counseling session itself. This part must be filled during the meeting, or immediately after it. However tempted you may feel to fill out the Key Points of Discussion field in advance, it may seriously hurt the whole communication process. Counselors must set goals in order to create effective action plans. These goals are determined at the end of each session. This is essential for keeping the counseled individual motivated, helping define specific trackable aims and providing clear and comprehensive directions. Part IV contains an assessment of the action plan proposed in Part III. Its purpose is to help the counselor evaluate whether the actions taken helped the individual and to provide information for follow-up sessions.